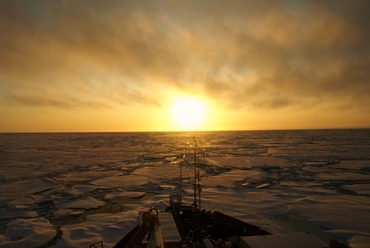 Arctic sunset: Credit: V. Dansereau, 2010.NERSC's new project neXtWIM: Waves in the next geration sea ice model (2015-2018) has just been funded by the Research Council of Norway Klimaforsk program. The main objective is to include wave-ice interactions such as ice break-up due to waves in the next generation sea ice model neXtSIM. neXtSIM is a new dynamic/thermodynamic sea ice model currently being developed by the Sea Ice Modeling group at the Nansen Center to make the drift and deformation of sea ice in response to wind, wave and current forcings significantly more realistic. The project's second objective is to use this improved sea ice model to set up a high-resolution, Arctic-wide forecast system for waves and sea ice. As well as having greater accuracy in the central Arctic, this system will assist Arctic infrastructure (eg the Norwegian coastguard) and industry by providing information about wave height and floe size in the Marginal Ice Zone (MIZ) - the boundary between the sea ice and the open ocean. For more information, feel free to contact Pierre Rampal and/or Timothy Williams.